MILWAUKEE (AP) — If Democrats sue to prevent Republicans from diluting the powers of newly elected governors and attorneys general in Wisconsin and Michigan, the lawsuits will probably center on one question: Are lawmakers usurping authority that belongs to the executive branch? The legal threat arose after Republicans passed bills Wednesday that would give lawmakers leverage over actions previous governors and attorneys general could carry out on their own. If the bills are signed by outgoing GOP Gov. 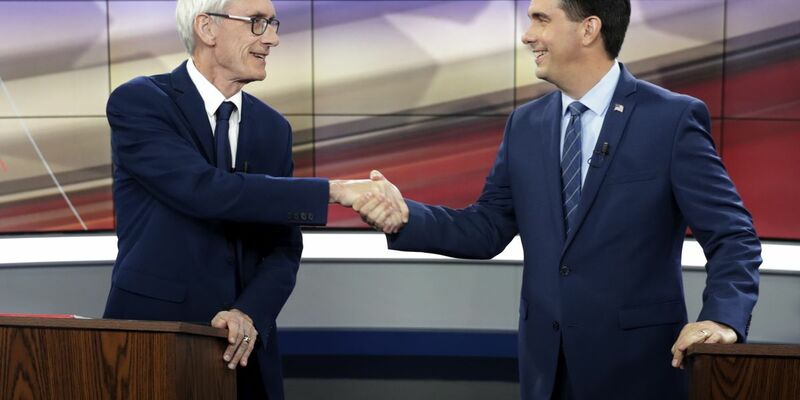 Scott Walker, lawmakers will decide when the state can withdraw from lawsuits, and the new Democratic governor will have to ask permission to adjust programs that are run jointly with the federal government, such as Medicaid. "Separation of powers is an essential part of overall governance and built into the constitution," said Caroline Fredrickson, president of the American Constitution Society, a liberal legal organization. "I think that's going to be issue one." Walker, who was defeated last month by Tony Evers, has indicated support for the GOP measures, which would also empower lawmakers, not new Attorney General Josh Kaul, to decide whether to pull Wisconsin from a lawsuit challenging the Affordable Care Act, a promise of both Democrats' campaigns. Evers said he was going to issue that order on his first day. Now he may have to support a lawsuit to get that power back. "If you look at this package of legislation, the Legislature is trying to say, 'You have to get our permission to do stuff. We're your supervisors. The Legislature is not the supervisor of the governor," said Lester Pines, a Madison attorney who frequently represents Democrats. Republicans who control the Legislature say they are confident they will survive the legal challenges. "They have the right to go to court. We've already vetted these with legal experts that we believe have shown that they are clearly constitutional," Assembly Speaker Robin Vos said. The GOP actions in Wisconsin mirror what the party has done after losing control of the governor's office in Michigan this year and two years ago in North Carolina, where the state is still mired in lawsuits. Courts have sided with Democrats there when judges found that lawmakers prevented the governor from carrying out executive branch duties. North Carolina Republicans defended their actions by saying they were simply rebalancing constitutional powers between the executive branch and the Legislature — an argument the Wisconsin GOP has also made. The threat of lawsuits also looms in Michigan, where Republicans are considering proposals to strip campaign-finance oversight from the new Democratic secretary of state. With a Democrat taking control of the attorney general's office, lawmakers also want to have authority to intervene in lawsuits. Groups that collected hundreds of thousands of voter signatures for minimum wage, paid sick leave and anti-gerrymandering initiatives could also sue if Republican Gov. Rick Snyder signs bills that would significantly scale them back. The GOP-led Legislature adopted the citizen-initiated measures before they could go to voters, so they could be more easily amended after the election. "If any of this legislation passes, I think there are going to be a number of state constitutional challenges, separation of powers being just one among them," said Mark Brewer, a lawyer for the minimum wage and earned sick time groups and a former Michigan Democratic Party chairman. Howard Schweber, a political science professor at the University of Wisconsin-Madison, said Republicans "seem to be under the impression that separation of powers refers to parties rather than branches of government." When Republicans voted to limit the powers of Evers and Kaul, they also approved limiting early voting to two weeks, instead of the current 47 days. That proposal is viewed as most vulnerable to a successful legal challenge because a federal judge previously struck down a similar measure from Wisconsin Republicans, saying the limitations were meant to disenfranchise black Milwaukee residents who traditionally vote for Democrats. With Walker leaving office next month, Republicans also passed a measure to ensure one of his policies remains intact: requiring childless adults under 50 to work to qualify for health insurance through the BadgerCare Plus program. Evers cannot withdraw the federal waiver that is part of the requirement because he would first have to go through the GOP-controlled Legislature. "That does raise some questions about whether that essentially violates the separation-of-powers principle," said Paul Nolette, a Marquette University political science professor who served as the legal counsel for the Labor and Workforce Development Committee in the Massachusetts House of Representatives. For cases that start in state court, a big hurdle for Wisconsin Democrats will be making their arguments before a Wisconsin Supreme Court controlled by conservative justices, said Mordecai Lee, a former Democratic state lawmaker and professor emeritus at the University of Wisconsin-Milwaukee. Lee said there's a strong argument that curbing Evers' authority is unlawful because the state constitution says: "The executive power shall be vested in a governor." But, he said, such a ruling is "unlikely in political reality." "When it comes to separation-of-powers issues, our Supreme Court, like every other supreme court, is very cautious," Pines said. That caution is because courts "are subject to the same type of potential intrusions from the Legislature." Associated Press writers David Eggert in Lansing, Michigan, and Gary Robertson in Raleigh, North Carolina, contributed to this report.